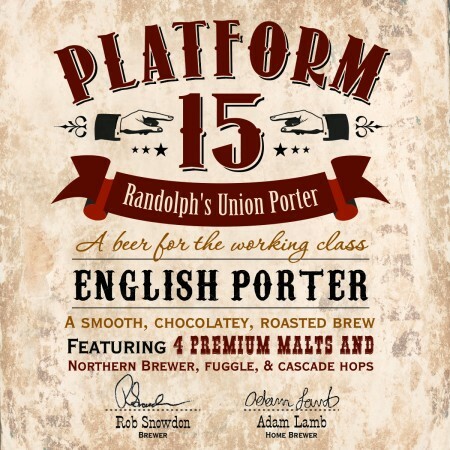 ST. THOMAS, ON – Railway City Brewing has announced the winning beer from Platform 15, the brewery’s 4th annual homebrewing competition, will be commercially released this week. This brew contains four premium malts and three types of hops including northern brewer, fuggle, and cascade hops. Aromas include roasted coffee beans, pumpernickel bread, and sweet molasses. Black coffee and dark chocolate immediately hit the front of the palate, slowly fading to reveal a complex yet balanced blend of toasted grains, black licorice, raisin and walnut. Randolph’s Union Porter will be officially released on Thursday September 3rd with a launch party at the brewery starting at 7:00 PM. It will be available in 500 ml bottles at the Railway City retail store while supplies last.